New York Times bestselling author Donna Grant rounds up the hottest cowboys in Texas in her latest novel of no-holds-barred passion. Audrey Martinez is a veterinarian who has devoted her whole life to the care and protection of horses—even if doing so leaves her little time for meeting a man. Who would have thought that a strange case of criminal horseplay would lead her to falling deeply, wildly in love? If only the man who makes her heart race faster than a wild mustang would let his guard down, that is. . .
Caleb Harper is no ordinary cowboy. Sure, he wears his hat, boots, and jeans like a second skin, and displays an easygoing charm that comes from years of working on the ranch. But with his military background, and Army buddies at his side, he is tried-and-true Texas tough. Audrey knows she can trust a man like Caleb to help her save horses. But can Caleb trust himself to resist his attraction to Audrey—or will the sparks of their desire end up getting them burned? 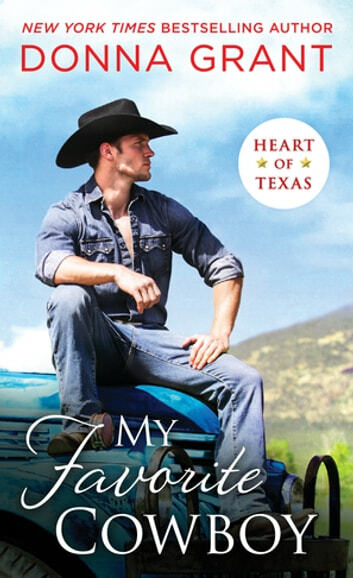 Another wonderful book in the Heart of Texas series that has the perfect blend of romance and suspense (and cowboys!) to lead to a very satisfying happy ever after. Just like his siblings, Caleb Harper has some serious abandonment issues that run deep and have him convinced that anything other than one-night stands and superficial relationships just aren’t in his future – anything more would be too risky and he’s convinced he could never trust anyone with his heart. What he fails to see is that the way he lives his life ensures that none of that is true – his love for his family, and the friends that have become part of his extended family, show just how deep he’s willing to forge a bond...but not until Audrey Martinez comes into his life does he even think love would be possible for him. Audrey was such a great character. She is an awesome big sister to Maddy, dedicated to her career as a vet, and would do anything to save or help any horse who needed her expertise or attention. That leaves little time for romance, and knowing how devastated her father was when her mother passed, she always finds an excuse to end a relationship before it can actually get started. But when she meets Caleb there is an instant attraction that has her start thinking that maybe there could be more. I fell in love with the East family in the previous book (book 2, but the first in the series I read), so it was no surprise that they got involved when their friend needed their help to figure out what was happening to his horses. It also was no surprise that once they got know Audrey and Maddy that they quickly added them to their family and committed to whatever it took to keep them safe as well. Caleb and Audrey didn’t have an easy time finding their happy ever after and at times I just wanted to sit them both down and give them a good talking to and make them communicate with each other. There was also some family meddling – for the good and the bad – that impacted these two, but in the end, despite it all, I loved watching these two come together and figure out that love made them stronger and not weaker or more vulnerable. This was another great read in this series and I can’t wait to see what the author has in store for the rest of the East clan. This one is a must read for anyone! I received an advance reader copy from the publisher via NetGalley which I voluntarily reviewed. Donna is one of her book series. I liked this series. When I read I almost cry every time. This time it tore me a part with tissues!Audrey is an equine vet and is trying to save poisoned horses. Caleb and his brother is working to put up a good security for safe. Caleb and Audrey fall for each other. Audrey's father ran when his wife died. Cable saw his mother run away from him and his brother and sister. There were a lot of people to finish to save the horses! Audrey goes to a break for awhile. Then the poison is another of the same way. But! Audrey is maked as the poison! Audrey is the best vet. There are lots of action in this book. I recommend for you to read this book. You should give this book a chance. Enjoy reading heavy, hard story! My Favorite Cowboy by Donna Grant is book three in her Heart of Texas series. My Favorite Cowboy can easily be read as a standalone. For better understanding I recommend to read the books in order. The previous books are The Christmas Cowboy Her and Cowboy, Cross My Heart. My Favorite Cowboy tells the story of Audrey and Caleb. Audrey Martinez is the lokal veterinarian. Her job is her calling and when horses get hurt and sick she hurts with them. The owner of a auction house calls her for help and bam she's involved in a nasty war. And there's Caleb. He doesn't do relationships and has abandonement issues. He meets Aubrey and they have this crazy insta- connection. Favorite Quote: " Always follw your heart. " My Favorite Cowboy is a beautiuful story, excellent written, beautifully thought out and beautifully told. I loved the story and the characters and give 4,5 stars.